GST produces a long running series of stained glass pattern books and premium glass bevels. 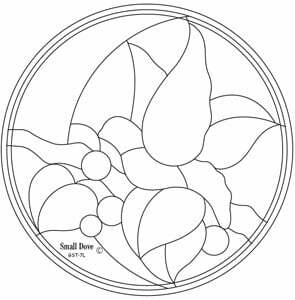 Use this free pattern with the GST Small Dove bevel cluster, item# GST7L, to make a contemporary, country themed project. Find even more great GST products here at Delphi. Viewing these downloadable file requires the use of the free Adobe Acrobat Reader. If you do not have the free Adobe Acrobat Reader on your system, you may download it from the Adobe web site.